I’ve realized that one thing I’ve completely forgotten to document on this trip is the FOOD. 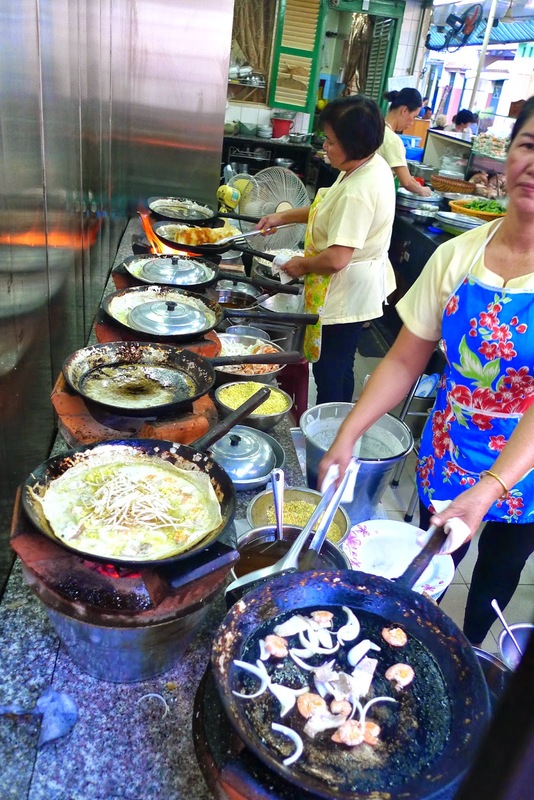 On our round-the-world trip in 2010, I was diligent about recording our culinary adventures. Steak heaven and the cochina debacle in Brazil. The best street food in Egypt and a round-up of some other African mainstays. The spiciest soup and most scrumptious snacks in Singapore. Cause who doesn’t love to talk about delicious things?! In an attempt to make up for my gross negligence, here is a recap of some of our favorite eats in Vietnam. Literally, “noodles with grilled meat”, this was quite possibly my favorite thing to eat in Vietnam. 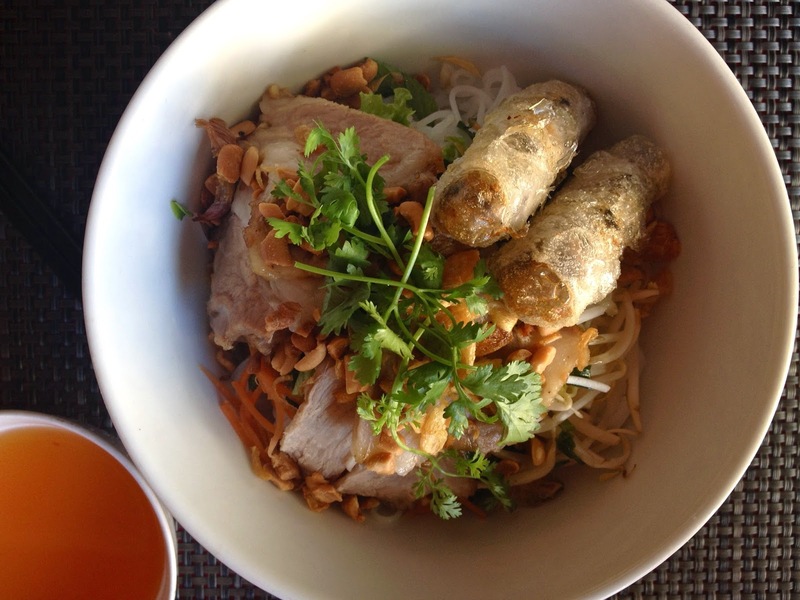 A mountain of fresh herbs and cold rice noodles topped with sumptuous grilled pork. Garnished with bean sprouts and pickled veggies and roasted peanuts. Dressed in a fish sauce and red chili concoction that was delightfully non-fishy. All for about $2. Take this already perfect dish to varsity level by ordering bun thit nuong cha gio – With the addition of a crunchy spring roll on top. Cause everything is better when you add deep fried. Where there’s bun thit nuong cha gio, there’s… whatever this dish is called (I can’t for the life of me find the name of it). 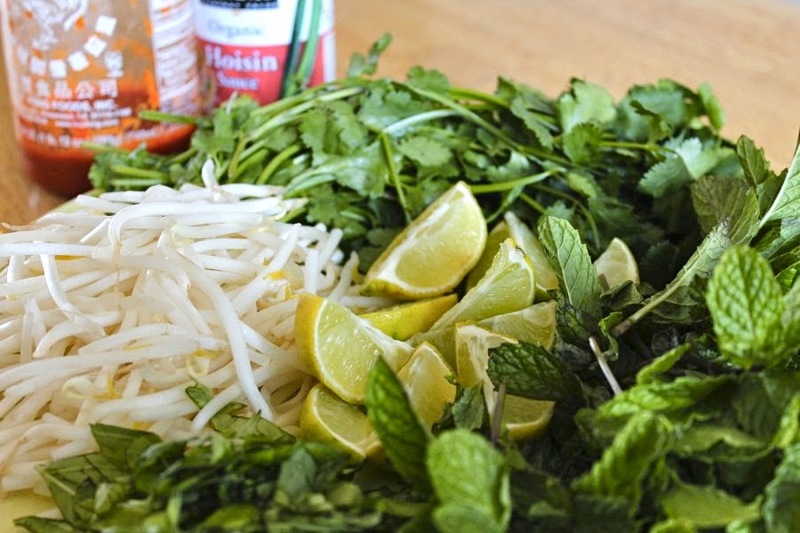 It’s essentially a deconstructed version of bun thit nuong, using many of the same ingredients to make your own fresh spring rolls. I take back what I said before. THIS was my favorite thing to eat in Vietnam. And with enough to feed two for $4, why not. Rice paper. Rice noodle-y stuff. Lettuce. Fresh, fragrant herbs. Pickled carrots and radish. Cucumber and starfruit. Crushed red chilies. Fish sauce. PORK. Mouth watering, fresh-off-the-grill, perfectly seasoned pork. Topped with sweet, salty, succulent, crunchy, fatty, caramelized pork crackling (don't knock it till you try it). And peanuts and stuff. Oh lord I think I just booked a flight back to Vietnam. GIMME SOME. My favorite place in Saigon to eat both of the above dishes. Sitting on a shared bench at a local restaurant in Nha Trang, I was struck by order envy by the guy next to me. He ended up being our best friend in town and the dish, Vietnamese steak & eggs, became my go-to breakfast every single morning of our stay. A perfectly tender little piece of steak. Onions. And a fried egg. Sizzling harmoniously in a cow shaped skillet, and topped with a peppery tomato sauce. 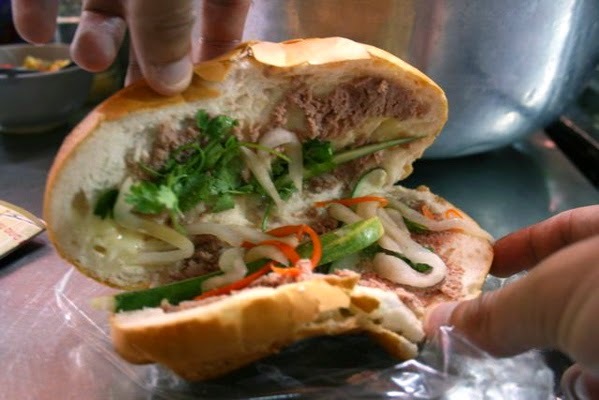 Served with a fresh, airy, flaky Vietnamese baguette. All for about $1.70. It's specific to this region, so sadly I never found it anywhere else. And I mourned the loss painfully. While I wallowed in my bo ne bliss, Reece found his own happy place in a plate of com tam soon nuong. A Vietnamese pork chop and broken rice, preferably topped with a fried egg. And, at the good places, served with some spicy sauce and pickled veggies. This hearty meal is an even bigger steal at about $1.25. Reece is so hooked, he plans to take this breakfast tradition home with us. I'm currently googling "vietnamese bbq pork chop recipes"
This lady knows a think or two about grilling pork. Let's call these "rice paper egg tacos". They are WAY more addicting than they sound. If you pass a lady on the sidewalk fanning the flames of some charcoal in a tin bucket… Stop! Give her 50 cents!! Eat one!!! Order it without shrimp if you, like me, don't want crunchy fishy bits in your taco. What you will get is ground pork, chives, quail eggs, and butter. All scrambled up inside and crispy and golden and delicious. I made Reece walk back here the following day so I could get more. Step into my sidewalk kitchen. 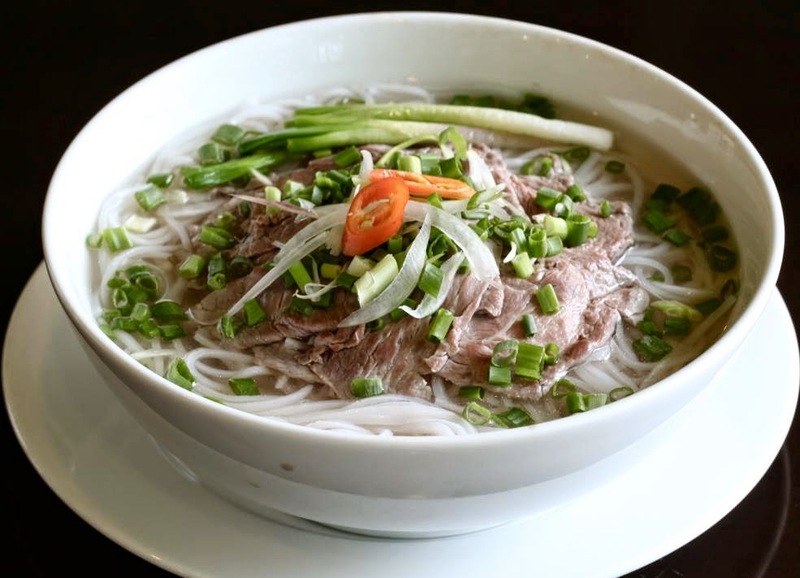 If you've ever eaten Vietnamese food, I'm pretty positive you've eaten pho. Long before Vietnam was a blip on my traveling radar, I knew of the noodle soup that introduced this country's eats to the masses. Honestly, I was never that interested in it. I had no idea what I was missing. Rich broth, warm noodles, tender meat (usually beef or chicken), and - the best part - a heaping pile of lime and chili and fresh herbs alongside for you to customize to your heart's content. All for about a buck fifty. We ate it so often I never even thought to take a photo of it, so I had to borrow from google. It's like a warm hug for your stomach. I'm gonna need more chili. 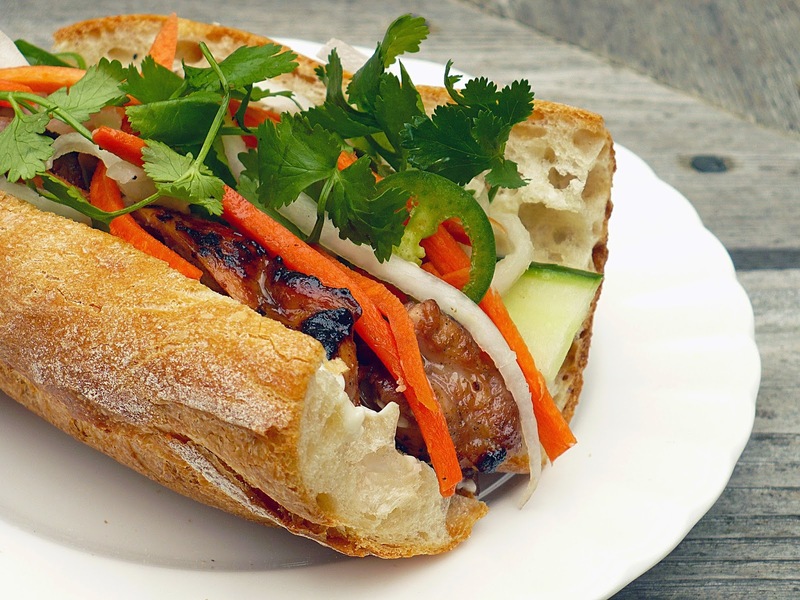 The banh mi I want. The banh mi I got. 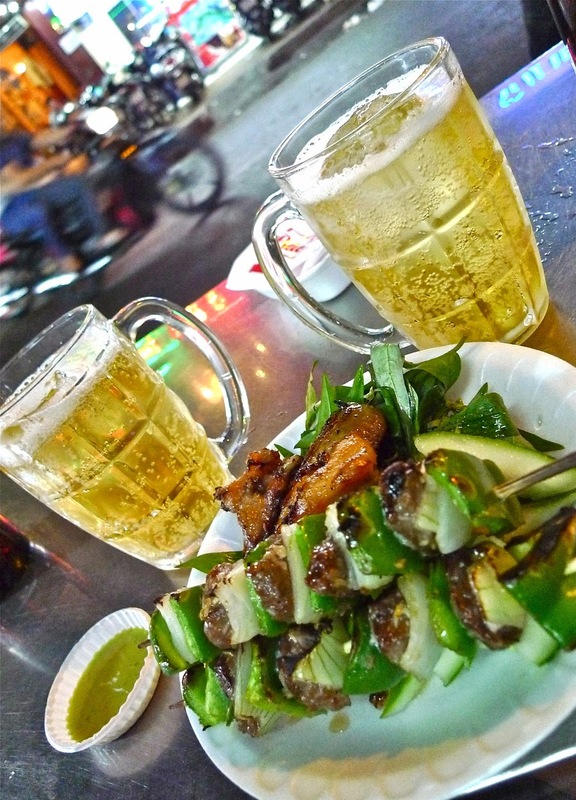 There are few experiences more quintessentially Vietnam than sitting on a tiny plastic stool on the sidewalk, sipping cold draft beer, nibbling on street food, watching the world go by. On the main backpacker road of Saigon, several BBQ joints compete for customers with a plethora of meats on sticks and just the right amount of billowing smoke and flowing draft to keep you coming back for more. Priced around $1 each, you might as well try them all. This was a slow night. On a weekend, those stools are full and spilling into the street. Another popular grilled item, this one is ground beef wrapped in a betel leaf and grilled. Often sharing the coals with some tender little sausages. It wasn't my favorite dish, but it was a popular one and worth a mention. Follow the smoke. And your nose. If you haven't already gathered that pork is the best meat in Vietnam (or anywhere, for that matter), this might help spell it out for you. Another rice noodle and herb based dish, this time with mini ground pork patties swimming in a sweet and spicy broth. Each element is served individually so you can mix and prepare to your liking. We ate this in a pretty nice little restaurant, and it was still only about $1.65. I'm salivating right now thinking about it. The four food groups: Juicy, sweet, spicy and porky. 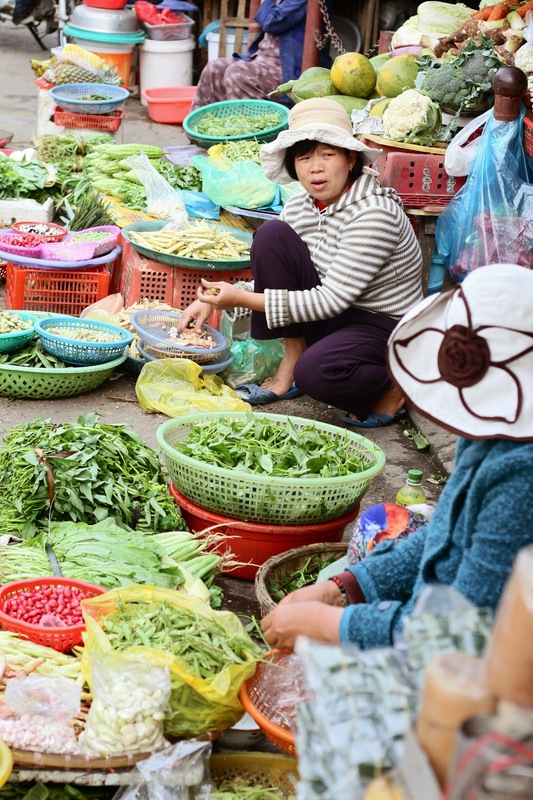 If you think all we do in Vietnam is walk around and drink beer and eat pork and noodles every day, you'd be wrong. Sometimes, we walk around and drink beer and eat salads too. Cause Vietnamese salads are AMAZING. I've realized that all of the creamy dressings and savory toppings I admittedly love on a salad back home (hello cheese. oh hi bacon.) wouldn't be necessary if I knew how to use deliciously fresh herbs the way they do here. Papaya salads. Banana flower salads. Mango salads. Full of ingredients and flavors I don't even recognize. And absolutely delicious. Herb gardens. Where the magic happens. 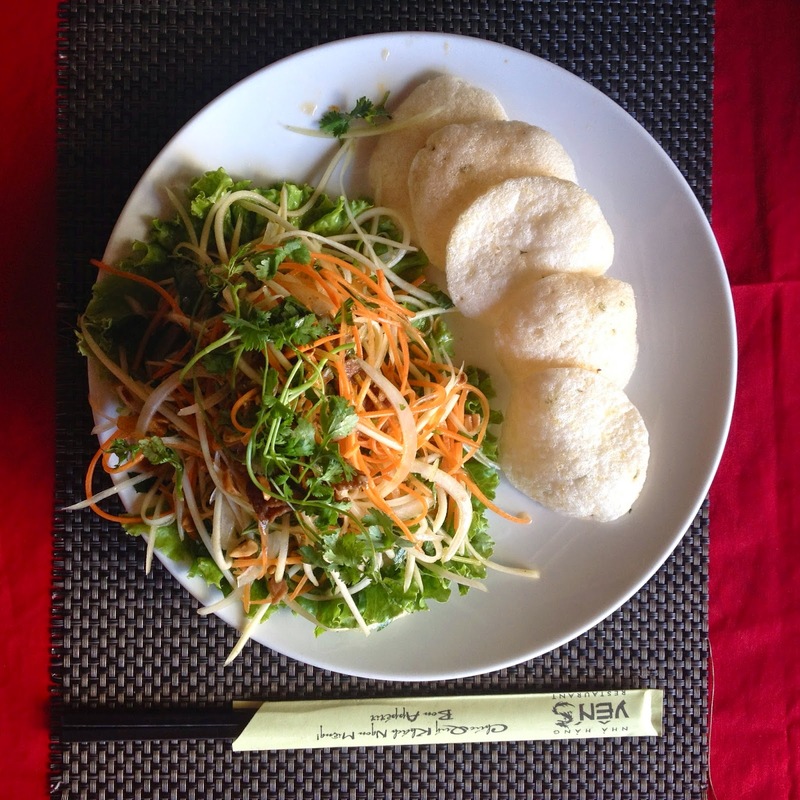 An entry about the food here wouldn't be complete without a mention of banh xeo. Like a Vietnamese crepe, it's a sizzling rice flour pancake stuffed with fatty pork and shrimp, folded over a handful of bean sprouts, and consumed wrapped in mustard leaves and herbs. A little too fishy, heavy and greasy for my tastes, especially amongst all of the light fresh fare on offer here. But we photographed the experience (and went to the same place Anthony Bourdain did! ), so I may as well include it, right? If it's good enough for Anthony, it's good enough for me. I don't know what the Vietnamese name is for this, cause the restaurant's only sign merely stated "The best spit roast pork & noodle shop in the world (probably)." Who am I to argue with a superlative like that?? Pork that was both crunchy and tender. Broth that was spicy and salty. 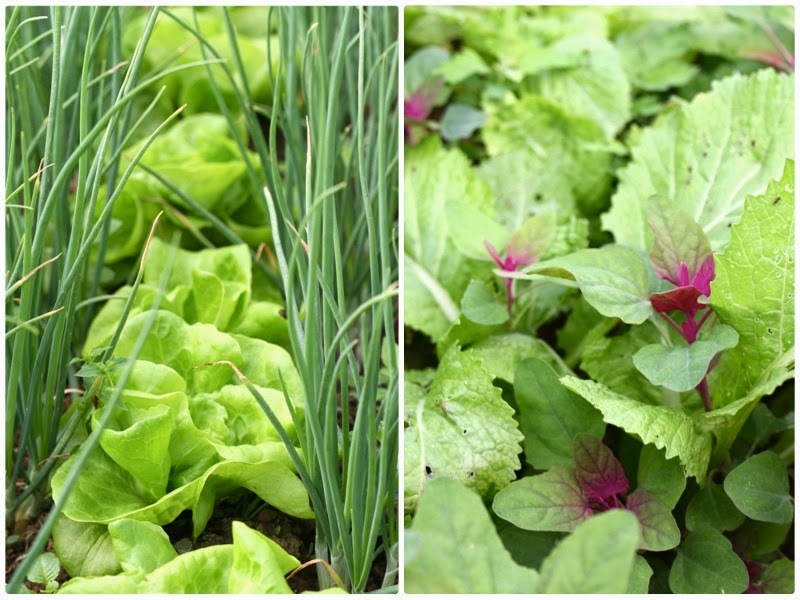 Herbs that were fresh and fragrant. It's a dish we only came across once during our two months in Vietnam, but it will not soon be forgotten. This isn't a dish, but rather a restaurant. A restaurant that is so f*cking delicious, that it deserves its very own category. Just outside of the central tourist area in Hoi An, this outdoor BBQ joint serves up the most delicious grilled pork skewers with all the usual DIY spring roll suspects, PLUS cha gio, banh xeo, fiery chili sauce, savory peanut sauce, AND dessert. It's all you can eat for $5 per person, and the food just keeps on coming until you beg them to stop. Seriously, this place is worth a flight to Asia. 33 years on this planet, and it took Vietnamese coffee to turn me into a caffeine drinker. Strong and rich and a little sweet, it's an addicting way to start your day. Each cup is brewed individually, oh so slowly, via a small gravity filter above your mug. 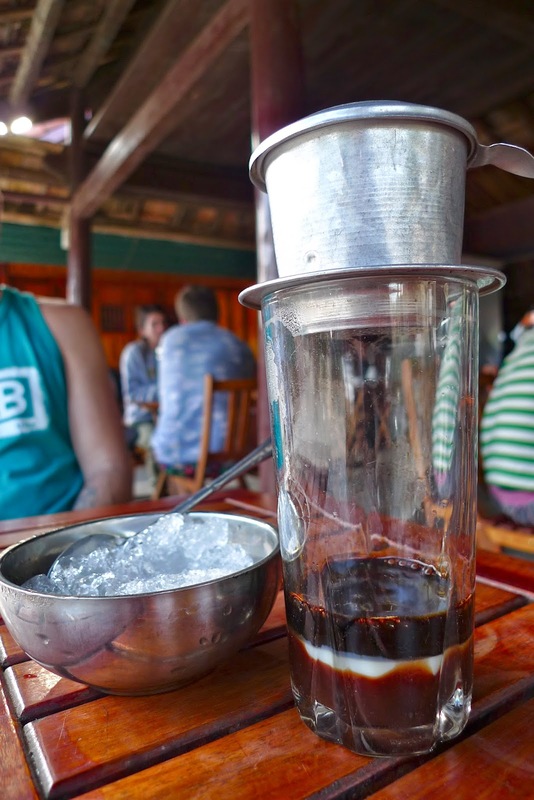 If you're really looking for a treat, go for ca phe sua nong, and sweet condensed milk will greet your dripping coffee at the bottom of your mug. Or on a hot day (i.e. every day), get yourself a ca phe sua da, over ice. YUM. Why stop at condensed milk when you can also add chocolate?! 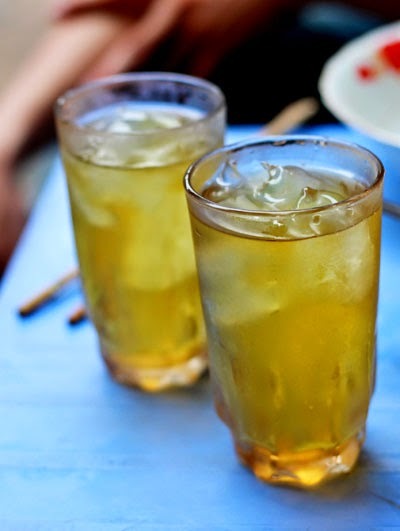 Pronounced "cha da", this iced green tea quenched my thirst unlike anything else in the world when sweat was dripping down my face just standing still under the Vietnamese sun. Thank goodness, because it comes for free at many places while you wait for your food or coffee to arrive. I became so obsessed with it - and had no idea what it was called - that I'd patrol the streets looking for people drinking it to try to hunt down where it came from. It's nearly impossible to find unsweetened iced tea outside of the US, which made this little discovery all the more exciting. Honorable mention for the Vietnamese obsession with buckets o' booze. We did not partake in this sugary hangover-fest, but it was fun to watch other people do it! If you find yourself in Vietnam and are curious where to find any of the dishes pictured above, here's a MAP for your dining pleasure.